3 Virginia 55+ Communities with Easy Commutes to Washington D.C. Whether by car or train, these Virginia communities provide an easy commute to D.C.
Washington, D.C. is often thought of as a young person’s city, and in fact, most of the population growth in recent years has been among those under 30. But, that doesn't mean it's not a good place to retire, especially considering its entertainment, dining, and cultural options. This shouldn’t come as a big surprise for people living in the Mid-Atlantic since the city has so much to offer. Active adults can take advantage of the free Smithsonian museums and zoo, easy-to-use public transportation, biking on both city streets and rail trails, and access to green space. D.C. is experiencing a housing boom, but the suburbs offer easy access to many of the amenities in the city without living in the city. In Virginia, the Metro system, highways, and the VRE commuter rail all provide a way for residents in the suburbs to get into the D.C. area easily. These 55+ communities have the easiest commutes into Washington, D.C. Located in the Northern Virginia suburb of Fairfax, the Saintsbury Plaza community is made up of 111 condominium homes. This is by far the community in the area with the easiest commute into Washington, D.C., but also a great option for active adults who don’t want to drive everywhere. The Vienna/Fairfax metro station is just a five minute walk, while a shopping center with a grocery store, restaurants, and a coffee shop is a short drive away. And although the condos are close to amenities, the community borders East Blake Lane Park, giving residents a scenic wooded area to walk or bike. Within the active adult community, residents can enjoy the exercise room, catering kitchen, and social spaces. Walhaven at Kingstowne is an intimate community of just 32 attached homes near Springfield. Located near the intersection of Interstates 495, 395, and 95, residents can be in the heart of D.C. within a 30-minute drive, and in Old Town Alexandria in just 15 minutes. For residents who don’t want to drive, the Franconia/Springfield Metro stop is less than two miles away. Active adults who like to bike can also commute on the nearby scenic Mount Vernon Trail, which extends from the Arlington National Cemetery across the bridge from the National Mall to George Washington’s former estate. While residents can enjoy parks, green spaces, shopping, and golf courses near Walhaven at Kingstowne, the community also includes two pools, two fitness centers, and tennis courts. Spring Hill provides homes for active adults looking for a larger age-restricted community close to D.C. Del Webb built just under 300 single-family, attached, and condominium-style homes between 2006 and 2014, which are now offered for resale. While not quite as close to the city as Saintsbury Plaza or Walhaven at Kingstown, Spring Hall is just off I-95 in Lorton. The community is about a 40 minute drive from D.C. and about 15 minutes south of I-495. For residents who wouldn’t want to drive into the city, the Springfield/Franconia Metro station is only about 15 minutes away by car. 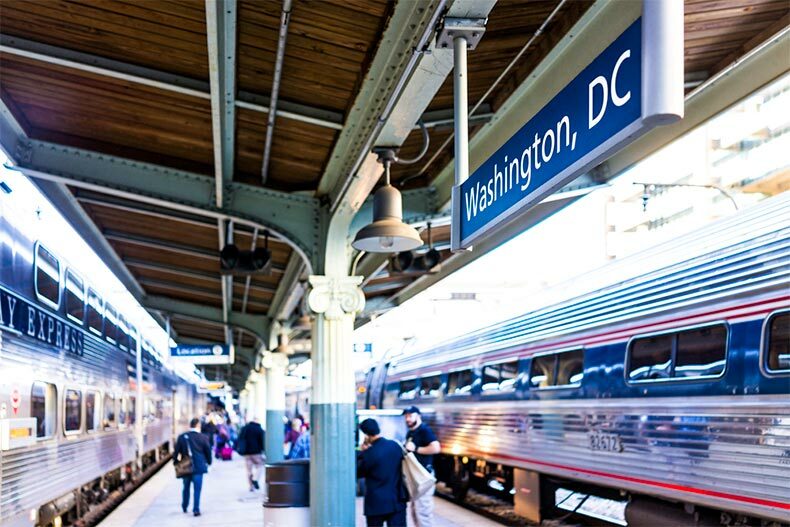 Just three miles from Spring Hill, the Lorton Amtrak/VRE station offers train and commuter rail service to Union Station and connections to Metro lines. Within the community, residents can enjoy getting to know neighbors in the community spaces at the clubhouse, or exercising in the indoor pool, on the tennis courts, or in the green space around the homes.